A few weeks ago, my husband fired up Starcraft II again. I’ve seen him return to games like World of Tanks or EVE, but not to an RPG. He said that it was by my influence. He had come to realize the value of story in video games and was taking his time to appreciate this one more. After completing Wings of Liberty and Heart of the Swarm, he excitedly invited me downstairs to see all the cinematics, pausing first to explain the events of the previous game to get me up to speed. Then our Father’s Day movie morning began. He played me almost all the cinematics and our daughters soon joined us, all cuddled up on the couch to watch Jim and Tychus battle the evil Mengsk and the deadly Queen of Blades. Special love for the big plot twist reveal that resulted in our five-year old giving the best shocked OMG face ever (if only I could have captured that for a reaction GIF!). My husband filled us in on details between scenes and soon enough, I was giving props to Matt and shedding tears to which my husband nodded in sympathy, warning me that it would only get bittersweet better. And I was so happy because you see, now my husband understands. No more skipping through cutscenes. Now he understands why stupid dumb stupid stupid pixel people bring out my tears and love and tears and tears and laughter and tears and laughter and rage and tears and rage and OMFG! and tears and FEEEELS! He understands why I was a sobbing mess at the end of Mass Effect 3 and why those tears of pain turned to tears of anger when EA and Bioware messed all that up. And why I was so happy to see my “friends and family” in the Citadel DLC a year later. I’m sure his comprehension comes with much thanks to Tricia Helfer, who once again brings the emotional power punch to an inhuman character seeking her humanity. That woman. One day I want to lock myself in a sound studio with her and just bask in her glorious presence. Bucket list updated. My husband has not quite reached my level of flail that often involves throwing down the controller or mouse down to go express these gaming feels online. And he hasn’t yet started obsessively taking screenshots. But that’s okay. Baby steps. 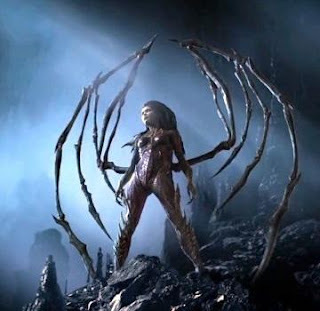 The third part of this Starcraft II trilogy, Legacy of the Void, comes out in December. We’re looking forward to another movie morning.